Learning how to make Native American dream catchers was one of many exciting activities students from the World Foreign Language Middle School (WFLMS) in Shanghai, China, enjoyed during their visit to Harker in mid-January. Xiao was one of 18 students visiting from Harker’s sister school in China. The students learned all about the dream catchers (a generations-old part of Native American culture) before making their own to take home as cherished souvenirs. The traditional dream catcher was intended to protect sleeping individuals from negative dreams, while letting positive ones through. This year, there was an emphasis on deepening the Chinese students’ understanding of Native American culture, according to Jennifer Walrod, Harker’s director of global education. Harker’s unique partnership with the school in the People’s Republic of China began in 2003 and is the first of its kind. The visiting students were accompanied by several chaperones (all teachers at WFLMS). They were welcomed to Harker and introduced at a morning meeting at the middle school before embarking on a tour of Stanford, including a visit to university’s museum to see the Native American collection. Harker’s middle school students and their WFLMS buddies had been corresponding since the fall. Come spring, a contingent of Harker students will head to China as part of the reciprocal exchange program, which is an annual highlight of the middle school experience for many grade 7 and 8 students. “This year, the students participated in a wide range of activities where they had the opportunity to deepen their understanding of American culture and the surrounding area. They learned all about football and tailgating, watched American movies, created their own lunch of ‘California cuisine,’ and participated in a walking tour of San Jose,” reported Walrod. While here, the exchange students observed and attended several middle school classes, including history, art, drama and dance. 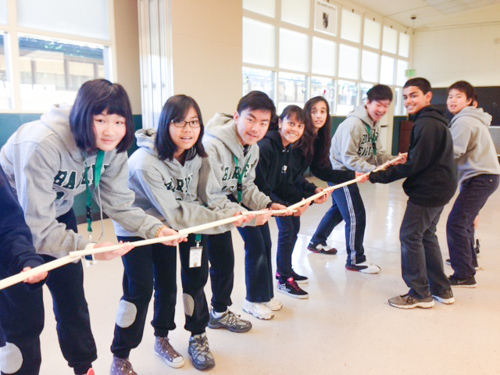 They also enjoyed a scavenger hunt on the middle school campus and a field trip to the Exploratorium in San Francisco. The WFLMS students’ visit ended with a fun farewell party – and a promise to see their buddies again in the spring!